What do you get when you put six members of the Gay Men’s Chorus of Los Angles (GMCLA) in tight fitting shorts and ask them to cycle from San Francisco to Los Angeles in seven days? Well, you get $80,000 to benefit HIV/AIDS services and raise awareness of HIV/AIDS. Among those participating from the GMCLA this year was its executive director, Chris Verdugo. 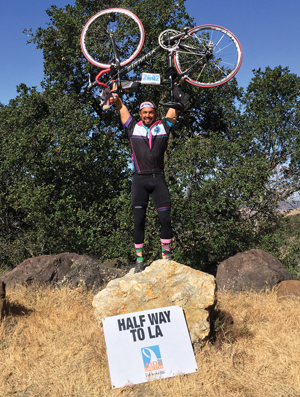 A good looking yet humble athlete, Verdugo participated in this year’s AIDS/LifeCycle ride, the annual 545-mile trek from San Francisco to Los Angeles to push himself both mentally and physically. But more importantly, he did it to help others. Having seen other members of the community live with HIV/AIDS, he’s a strong supporter of ending HIV/AIDS. While he certainly has an imposing physical body, Verdugo wasn’t always an athlete. As a child with asthma problems, Verdugo wasn’t very active. It wasn’t until he decided to participate in his first marathon in his thirties that he became interested in actively participating in sports. He kicked things off in typical Verdugo fashion by not only running in the 2010 Honolulu Marathon but also managing to raise over $12,000 for AIDS Project Los Angeles. 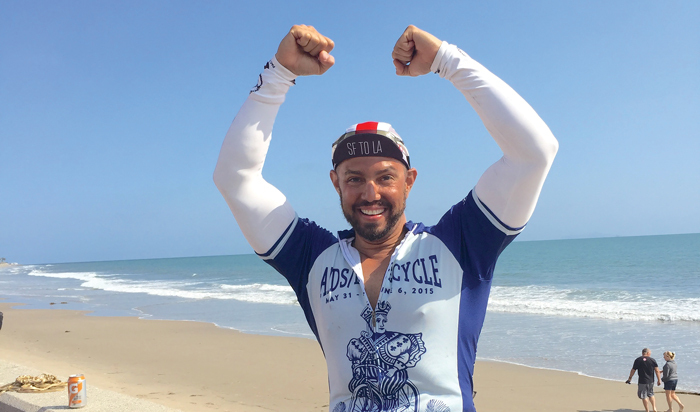 When asked why he decided to run the marathon and later participate in AIDS/LifeCycle, Verdugo responded by saying “I want to do things that push me and help me grow. But for me that is not enough. I want to do things that are attached to something.” In both cases that “something” was to raise funding for HIV/AIDS research, treatment and education programs. The ride from San Francisco to Los Angeles was definitely worthwhile but not always easy. Verdugo’s bicycle suffered six flats along the way. In fact, on the last day of the event a fellow cyclist stopped and helped Verdugo with his sixth flat tire. “I really didn’t know why he stopped to help – he was close to the finish – but that is what we do as AIDS/LifeCycle riders,” he said. Such kind and unexpected assistance is part of the “love bubble” that exists during the race. The love bubble is a combination of respect, kindness, generosity and love the riders all show one another during the week-long event. But the love bubble extends beyond the cyclists to include the all-important roadies. The 600-plus roadies make the event possible by supporting the riders through the day and setting up camp each night. The camp houses, feeds and treats the riders each night so they are prepared for the next day’s journey. Verdugo said that his friend Peter Wilson, another GMCLA member has participated in the AIDS/LifeCycle many times, even finishing as early as number seven in the race. In a characteristic show of modesty, he said “I don’t know why you are even talking to me when you could be interviewing Peter.” The reason we asked Verdugo is because he is much more than just a pretty face. As a weekend warrior he loves watching professional football, even to the point his friends have to ask him to quiet down. But he takes it all in stride, enjoying down time with his friends. He’s also committed to cycling as his sport—his new big passion is spin class. Those classes also prepared Verdugo for the 2015 Song Cycle. This fundraising event combined two of Verdugo’s passions – cycling and music. Far from being the strange paring it may appear at face value, the Song Cycle funds were raised for Vox Femina, the female counterpart to GMCLA that they helped found 18 years ago. As the executive director of GMLCA, Verdugo also organized the 2014 Voice Awards last year that honored the likes of out MLS player Robbie Rogers and LGBT allies such as Steve Young and Gary Hall, Jr. Chris Verdugo is truly an athlete and a gentleman with a song in his heart.